Summer heat is cranking up. That’s bad news if you’re trying to cut costs via air conditioning use. It’s good news if you’ve had it with the pesky allergy season. Stratus Building Solutions, the nation’s leading green commercial cleaning franchise, was proud to be a powerful resource and ally for allergy sufferers this spring. This spring’s pollen tsunami produced blankets of unsightly residue on cars, pathways and ponds. The affects of pollen aren’t simply superficial. A paint expert in Richmond says accumulated pollen on vehicles can lead to lasting damage. Then there’s the health issues allergy season delivers. The runny noses, the hacking, the watery eyes and the gut-wrenching sneezing: they’re not just annoying by-products of nature’s circle of life. Pollen-related health issues are responsible for millions of hours of lost productivity. The danger isn’t relegated to outside. Inside, including in homes and millions of office spaces, is a haven for debilitating allergies. Americans miss 24.5 million workdays each year due to “occupational asthma.” Unfortunately, employees are literally becoming allergic to work. Stratus Building Solutions spent the winter and spring months, arming facilities — office parks, daycares, retail, gyms, and even medical clinics — with vital products, information and solutions, to diffuse the dangers. A useful Office Allergy Checklist earned Stratus Building Solutions some prominent coverage on a wide range of platforms. That includes on ABC15 in Phoenix, the nation’s fifth largest city. 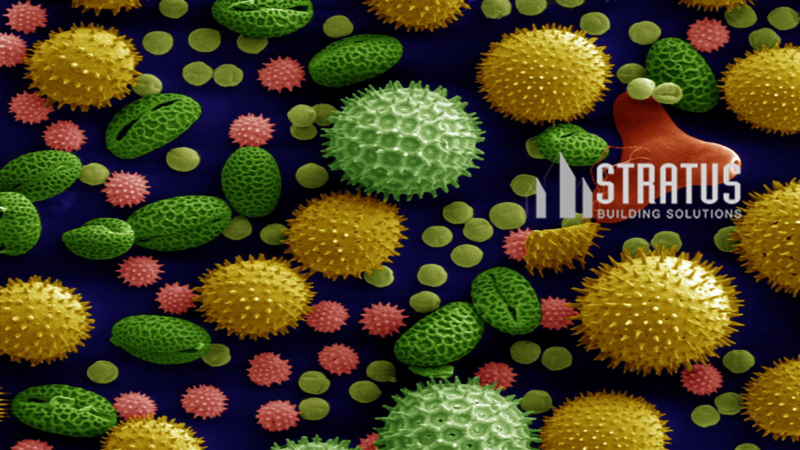 Viewers were educated on the causes of the excruciatingly long allergy season and the steps Stratus Building Solutions takes to mitigate the misery. Stratus Building Solutions was also positioned as allergy experts on Fox 42 in Omaha, NE. Master Franchisor Jim Morrison provided insight into best practices to rid the workplace of allergens. The toaster oven and the top and bottom of a microwave are just some of the places Morrison says get overlooked when getting rid of allergens. Stop Sprayin’ and Prayin’ – Ditch the reliance on fragrances, disinfectant sprays, chemical cleaners, etc. to mask smells and clean spills. Alkaline and acid cleaners contain dangerous chemicals and people are allergic to various scents. Use green, plant-based disinfectant wipes and consider a “scent-free” policy to combat these issues. And if an employee wears a strong perfume or cologne, it might be time to privately ask them to stop. Strong scents can aggravate allergies and make colleagues sick. Reward Early Birds and Promote Clean Eating – Pollen gets worse later in the day so encourage employees to arrive early. Spicy/bold foods trigger more histamines – sending people into allergy fits. So, make sure you know about your employees’ food allergies that may require your office to have a separate refrigerator or microwave to keep food separate. If you bring in lunch, consider catering with allergy-fighting foods, such as fish, walnuts, peppers and strawberries. Vent Away – Effective filtration is critical during allergy season. Conduct an indoor air quality test to make sure air is recirculated so you’re not sucking in outdoor allergens. Also, minimize workplace humidity (to less than 50%) and frequently clean poorly ventilated areas to protect against mold. Plan Projects – Don’t compound the pollen problem with other projects/items that spark allergic reactions. Save office improvement projects requiring painting for the holidays when many aren’t working because all types of paint can cause allergy issues. Many folks have latex allergies so eliminate all latex from the office, especially rubber latex products such as rubber bands, balloons, medical supplies and plastic bottles. And if possible, during allergy season, ask the lawn crews to come as early as possible (when pollen isn’t as bad) or late when everyone’s gone home. Stratus Building Solutions are experts in the field of keeping employees, employers, and of course, office guests safe in the environment they spend a majority of their time. Summer is here, but that doesn’t mean bacteria and viruses are taking a break. You need a cleaning service that knows how to keep your facility safe and healthy no matter the circumstance. Reach out to us at 888-981-1555 or check us out at http://www.stratusbuildingsolutions.com.